Einstein Healthcare Network is a private, not-for-profit organization consisting of several major hospitals and outpatient centers in the greater Philadelphia region. The Albert Einstein Society is an organization that funds research and innovative initiatives conducted by Einstein employees and physicians. Funds are raised primarily from the network’s 8,500 employees and 2,500 physicians; board members and volunteers from the local community are donors as well. In 2013, the Society raised approximately $635,000, but only a small percentage of employees contributed to the campaign. Graphcom was tasked with developing a marketing campaign that would both increase funds raised and improve employee participation rates. In 2014, we rebranded the Society and established a new campaign, resulting in a 7-percent increase in employee participation—and the highest-grossing season in the initiative’s 40-year history at $660,000. After a kickoff meeting with the client and in-depth research on their goals, target audience, and why employees should give to the Albert Einstein Society, we began our concept for the campaign. Step one: establish a logo. Our logo concepts were developed to convey a sense of scientific innovation and discovery, which would appeal to potential grant recipients, by using scientific symbolism such as an atom, a solar system, or a sine wave. In addition, we wanted each design to incorporate an attitude of fun and whimsy to appeal to employees as well as potential donors. We provided a total of eight logo directions, each with a touch of both science and personality. The client couldn’t select just one direction, so our designers made adjustments to perfect the piece. The selected logo symbolizes an atom and Einstein’s genius contributions to scientific thought. In addition, the symbol can be seen as a birds-eye-view of three people joining hands, coming together in a spirit of uplifting community. We offered the logo in each of the Einstein Healthcare Network colors. In the end, the client selected the purple version. Calm – A concept that, while new and fresh, will feel familiar and comfortable to the audience. This concept was designed to create a feeling of community participation among staff. By contributing even $1 per paycheck, any employee at any income level is capable of helping the institution grow, learn, and thrive. This concept was designed to create a playful sense of pride among Einstein staff. By contributing even $1 per paycheck, any employee at any income level is capable of supporting—and therefore embodying—the Einstein-like genius of the grant recipients who improve patient care. 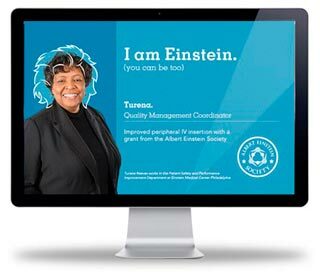 After presenting our two concepts, the client decided to move forward with the “I am Einstein” campaign. The goal of this campaign was to appeal to and attract Einstein staff members while giving the Society a more upbeat and community-centric identity. We identified 16 physicians and staff members who had donated to and/or received grants from the Albert Einstein Society. 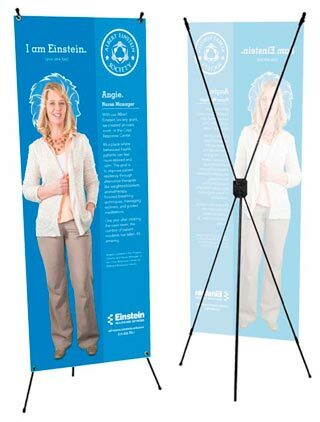 Posters: Created in the branded colors of the Einstein Healthcare Network, these 11” x 17” poster clings were applied to walls in hospitals and outpatient facilities throughout Philadelphia. Easy to apply, easy to peel, and eye-catching to passersby, these formed the foundation of the campaign materials. Table Tents: Each cafeteria table was adorned with a table tent that told a staff or physician story, explained the Society, and invited people to visit the website. Digital Signs: Near entrances and public areas, digital screens displayed ads for the Society. Employee screen savers were also used. Newsletter Ads: Employee and physician newsletters featured bright, colorful ads throughout the fundraising season. 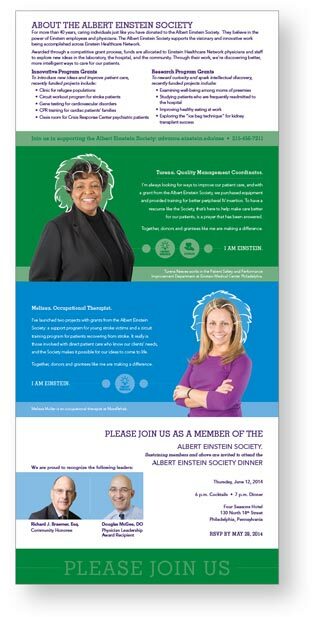 Employees, staff, board members, and others in the community also received a direct mail solicitation, in the form of an invitation to attend the Albert Einstein Society Dinner. Those who donate more than a designated level are invited to attend the celebration, which features awards and speeches to two outstanding Einstein staff and physicians, as well as a brief video highlighting the Society’s impact and success. Two separate invitations were designed: a more formal one for physicians and high-level community donors, and a more playful version for staff. 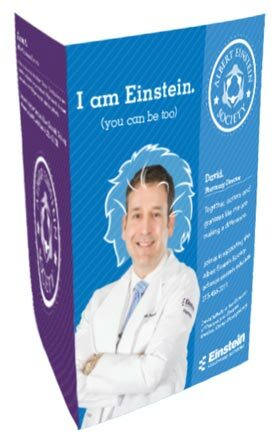 Programs: The event programs featured the “I am Einstein” campaign and were printed in a variety of colors—each in the Einstein Healthcare Network’s brand palette. With four vivid colors and eight seats to a table, the programs were a striking addition to the room’s décor. Spider Stands: Two stories of successfully funded projects were highlighted on large spider stands, which stood at the entrance to the dining room. During cocktail hour, guests perused these to learn more about the Society’s impact. Video Graphics & Theme: Graphcom coordinated with a videographer to create a short video about the Society’s impact and provide graphic elements that were incorporated into the film. Even better, the videographer implemented our suggestion that the film close with a collection of interviewees saying the phrase “I am Einstein,” bringing home the Society’s new brand. In the few years since rebranding with Graphcom, the Albert Einstein Society experienced its highest-grossing season in the initiative’s 40-year history at $660,000! In 2015 alone, that money funded 28 new programs and research grants and allowed 56 Einstein employees, physicians, and residents to put their genius ideas to practice. Graphcom continues to partner with Einstein Healthcare Network each year for the Albert Einstein Society fundraising campaign. In the years since, we’ve created additional pieces, including videos, additional event materials, and more, to inspire more employees to give. dollars were raised (the highest-grossing season in history). Want to Engage More Employees in Your Fundraising Efforts? Let’s talk. We’d love to get started on your next fundraising campaign.